Just off Lee Circle is a little slice of Columbia. Chances are you’ve driven by to take that shortcut to jump onto I-10. If so, you might have noticed the crowds that gather expectantly on the corner of Carondelet and Clio, waiting for the doors to open. They are counting the minutes to storm into Mais Arepas and to experience one of its namesake overstuffed South American specialties. And after you read about them, you probably will too. Owner David Mantilla is a native of Columbia and moved to New Orleans in 2003. After Katrina he became a founding member of Baru Bistro & Tapas on Magazine Street. Building on this experience, in 2012 Mantilla left to open Mais Arepas, which has been going strong ever since. For his solo venture, Mantilla puts the focus on arepas – white cornmeal cakes grilled to a toasty crisp exterior. A fundamental part of the Columbian food scene, there they are served for breakfast, lunch and dinner and are also a popular street food. Here they serve as the foundation for a number of artfully composed sandwich-like items. 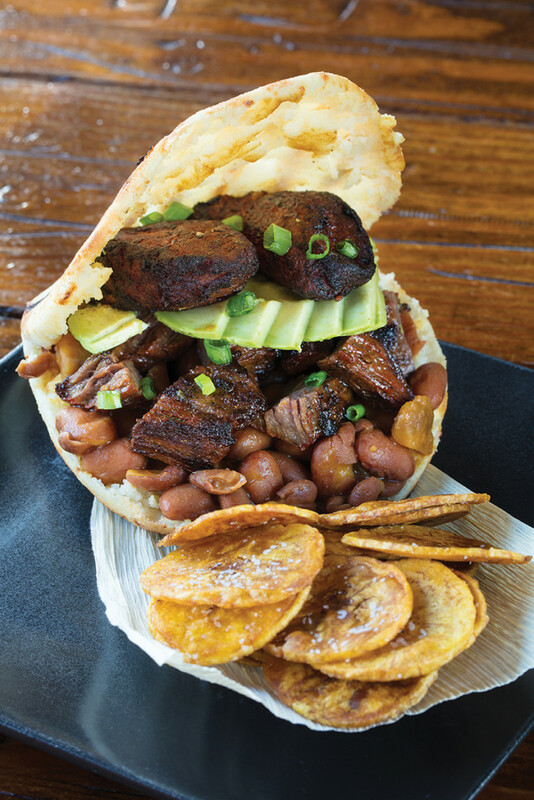 Try the Carnicera, made with grilled skirt steak, plantains, avocado and cranberry beans cooked down with pork belly. In the mood for something lighter? Try the Reina, stuffed with a chilled shredded chicken and avocado salad that gets some pop from lime and green peppers. Vegetarians have options as well, such as the Fanny made with plantains, avocado and melted mozzarella. “I wanted to build a short menu that was also very diverse around the arepa. Each one has a different main ingredient prepared in a different way,” Mantilla explains. Augmenting each arepa is a small dish of coin-sized fried plantain chips and a choice of accompanying sauce. There is the traditional Hogau, a ruddy concoction of red onion, red pepper and achiote spice. The Chimichurri is made with fresh cilantro, olive oil and garlic and has a brighter touch. The “Pink Sauce” is akin to a remoulade, and the Aji is like a pico de gallo but with a finer consistency. Part of the fun is pairing the right sauce with the right arepa. Mantilla also rounds out his menu with some hard-to-find specialties. One is the Ajiaco, an Andean potato soup made with chicken, corn, avocado and capers distinguished by guascas, a South American herb. Another is the Bandeja Paisa, the unofficial national dish of Columbia. It is a carnivore’s mixed-grill delight, featuring outside skirt steak, chorizo, chicharron just to name some of the components. “Any Columbian anywhere in the world will recognize this dish,” Mantilla says. Their cocktail program puts an emphasis on freshness as well. Have a seat at the bar and you can peek down at the artful layout of ingredients that go into the drinks. “We squeeze limes and cut the produce every morning,” Mantilla says. “If you start with fresh ingredients it will taste amazing no matter the drink.” A case in point is the Caipirinha, a variant on the mojito made with cachaça. Mais Arepas is a small restaurant and fills quickly. Early arrival will help get you a seat and they do take a limited number of reservations. It is also very popular with local chefs and the restaurant community in New Orleans – always a good sign. Mais Arepas, 1200 Carondelet St., Uptown, 523-6247, L Tues – Sat, D Tues – Sun. Closed Mon. A love of food from home is what prompted Chef and Owner David Mantilla to open Mais Arepas. Originally from Cali, Columbia, Mantilla was one of the original partners in Baru Bistro & Tapas, a pioneering restaurant on Magazine Street that paved the way for a storm of tapas-style dining places that came after. In 2012 Mantilla broke away to do his own thing with a tight focus on Columbian cuisine and Mais Arepas was born and the local dining scene is all the much richer for it. “We work really hard here. But when you love what you do, you do well, always,” Mantilla says. Baru Tapas is where David Mantilla got his start in the restaurant business. Not strictly Columbian, it nevertheless offers a wide range of pan-South American fusion style dishes, with a unique menu guaranteed to take diners in unexpected directions. Add to the mix a vibrant bar scene, and you have the makings of a seriously good time.